Please note: This program has been cancelled for Saturday, January 19 & Sunday, January 20. The Nature Center will close at 5pm both days, the regular time. The trails will remain open until 9 pm on these evenings if there is adequate snow cover. 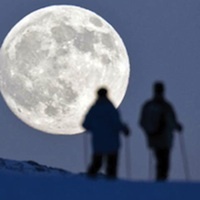 This is an opportunity for skiers and snowshoers to take advantage of the natural moonlight along Beaver Lake’s ten miles of trails. At trails’ end is the Visitor Center with exhibits and a comfortable meeting place. Hot chocolate and other refreshments will be available. For their safety night visitors should remember to sign-in and sign-out at the Visitor Center, go with a friend, and bring a flashlight in case a section of the trail is especially dark.